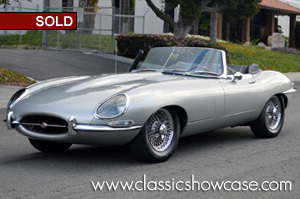 (SOLD) This striking 1967 Jaguar XKE roadster is a prime example of one of the era’s most desirable and iconic E-Type series made and features one of the most elegant color combinations of Metallic Silver and Black, finished off with a Black Stayfast top, and fit with chrome wire wheels. This beauty has had quite a bit of documented work performed to her to make her a great running and driving car. Some of the new parts installed in her recent life has been: a HD radiator, performance cams, stainless steel headers and exhaust system, balanced and blueprinted motor, vented discs, performance brakes, HD sway bars, performance shocks, 3:31 LSD differential, a Getrag 5 speed gearbox, gas tank, fuel pump with Grose jets, headlights, clutch slave cylinder, brake master cylinder, sport springs and torsion bars, heavy duty sway bars, Carrera adjustable shocks, Optima Battery, brake switch, seat belts, exhaust, expansion tank, a Pertronix electronic ignition, master switch, and the belts and hoses. Under its prior ownership it was well cared for and was stored in a climate-controlled facility and driven sparingly. This is a fabulous roadster for the Jaguar enthusiast that wants an E-type they can drive and enjoy that still looks great. 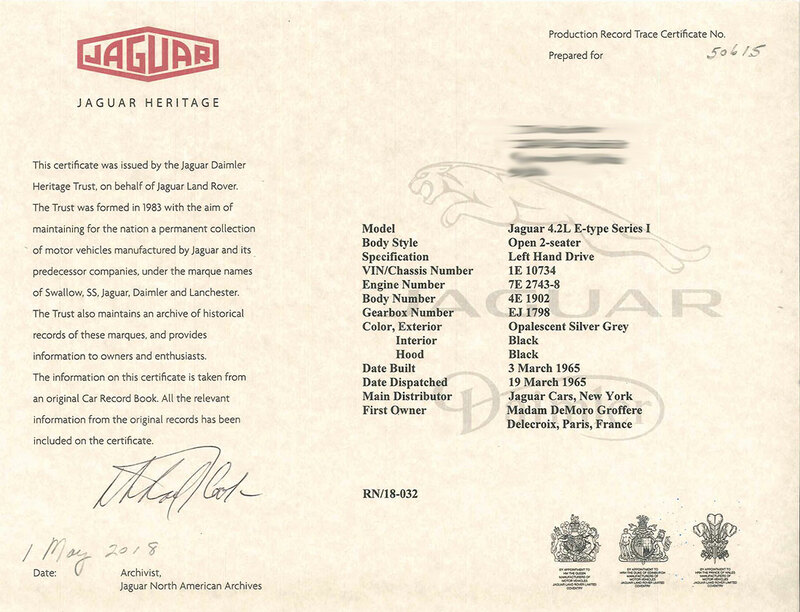 It is a highly collectible Western States E-type example that is a very good driving Jaguar and considered to be the best of all E-Type series models made. Launched in 1961 at the international motor show in Geneva, the XKE echoed the sensation of the XK-120, perhaps even more. An astonishing performance package, with amazing speed and handling, the XKE’s’ brand-new 4-wheel independent suspension system was so well conceived, it was used by Jaguar for over thirty years. The Series 1 4.2 is a very user friendly, sporty driver, with all-synchro 4-speed gearbox introduced by Jaguar in 1965 and is one of the most collectable of the E-Types. Some of the features of this model are covered headlights, toggle switches, full instrumentation with styling and a design that was way ahead of its time with center console, and arm rests. Other features of this Series 1 are its steep windshield and tail lights, which are placed above the bumper line in the rear deck. Similarly, the parking lights are above the front bumper line in the front fenders. In 1964 when the 4.2 was tested, fuel consumption was rated road reported at 22 MPG, and a top speed of 140 MPH.